MR. DARWIN'S long-standing and well-earned scientific eminence probably renders him indifferent to that social notoriety which passes by the name of success; but if the calm spirit of the philosopher have not yet wholly superseded the ambition and the vanity of the carnal man within him, he must be well satisfied with the results of his venture in publishing the 'Origin of Species'. Overflowing the narrow bounds of purely scientific circles, the "species question" divides with Italy and the Volunteers the attention of general society. Everybody has read Mr. Darwin's book, or, at least, has given an opinion upon its merits or demerits; pietists, whether lay or ecclesiastic, decry it with the mild railing which sounds so charitable; bigots denounce it with ignorant invective; old ladies of both sexes consider it a decidedly dangerous book, and even savants, who have no better mud to throw, quote antiquated writers to show that its author is no better than an ape himself; while every philosophical thinker hails it as a veritable Whitworth gun in the armoury of liberalism; and all competent naturalists and physiologists, whatever their opinions as to the ultimate fate of the doctrines put forth, acknowledge that the work in which they are embodied is a solid contribution to knowledge and inaugurates a new epoch in natural history. Nor has the discussion of the subject been restrained within the limits of conversation. When the public is eager and interested, reviewers must minister to its wants; and the genuine 'litterateur' is too much in the habit of acquiring his knowledge from the book he judges—as the Abyssinian is said to provide himself with steaks from the ox which carries him—to be withheld from criticism of a profound scientific work by the mere want of the requisite preliminary scientific acquirement; while, on the other hand, the men of science who wish well to the new views, no less than those who dispute their validity, have naturally sought opportunities of expressing their opinions. Hence it is not surprising that almost all the critical journals have noticed Mr. Darwin's work at greater or less length; and so many disquisitions, of every degree of excellence, from the poor product of ignorance, too often stimulated by prejudice, to the fair and thoughtful essay of the candid student of Nature, have appeared, that it seems an almost hopeless task to attempt to say anything new upon the question. But it may be doubted if the knowledge and acumen of prejudged scientific opponents, or the subtlety of orthodox special pleaders, have yet exerted their full force in mystifying the real issues of the great controversy which has been set afoot, and whose end is hardly likely to be seen by this generation; so that, at this eleventh hour, and even failing anything new, it may be useful to state afresh that which is true, and to put the fundamental positions advocated by Mr. Darwin in such a form that they may be grasped by those whose special studies lie in other directions. 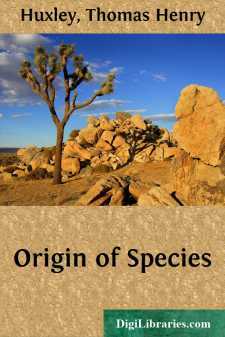 And the adoption of this course may be the more advisable, because, notwithstanding its great deserts, and indeed partly on account of them, the 'Origin of Species' is by no means an easy book to read—if by reading is implied the full comprehension of an author's meaning. We do not speak jestingly in saying that it is Mr. Darwin's misfortune to know more about the question he has taken up than any man living. Personally and practically exercised in zoology, in minute anatomy, in geology; a student of geographical distribution, not on maps and in museums only, but by long voyages and laborious collection; having largely advanced each of these branches of science, and having spent many years in gathering and sifting materials for his present work, the store of accurately registered facts upon which the author of the 'Origin of Species' is able to draw at will is prodigious.